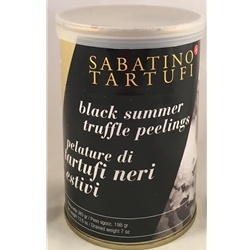 Summer truffle peelings are packed in brine and preserved in a water-based truffle juice. A careful selection of the best pieces of truffle guarantees the first-rate quality of this product. Recommended uses: Peelings add flavor to risotto, omelettes, and polenta. The juice from the peelings when drained may be ideal for the base of a tangy vinaigrette.